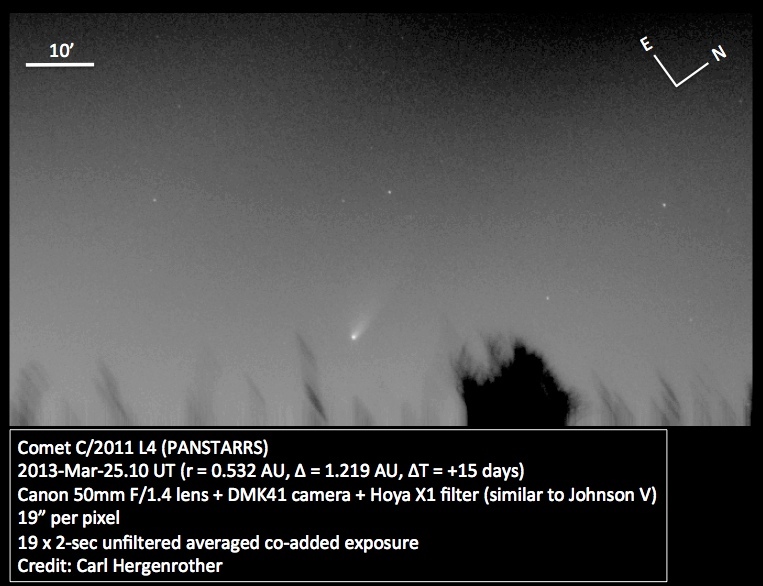 Comet C/2011 L4 (PANSTARRS) peaked between magnitude +1.0 and +2.0 in the days after its March 10th perihelion. Since then the comet has moved away from the Sun and Earth is now located 0.57 AU from the Sun (versus 0.30 AU at perihelion) and 1.23 AU from Earth (versus 1.10 AU on March 5). The comet is still a difficult object to observe since it located low in the northwestern sky during evening twilight. Adding to the difficulty is a nearly Full Moon and the fact that the comet has now faded to magnitude +3.0 to +3.5. That’s 4-6 times fainter than it was two weeks ago. The image below was taken from my backyard near Tucson with a Canon 50mm F/1.4 lens, Hoya X1 (Green) filter and a Imaging Source DMK41 camera. It is a composite of 19 2-second exposures. As you can see by the trees, the comet was already quite low at an elevation of ~5 degrees above the horizon. The image is also close to what the comet looked like in 7×50 binoculars. Close but not quite… I’d say the comet was looked a little fainter in the binoculars versus the image. I’ve finished my visual observations, and with binoculars, this comet .. I will continue later with telescope. C/2011 L4 (PANSTARRS) is now visible in the morning too. I spotted it today (March 27, 2013) at 5:51 am EDT, an hour before sunrise, with 16×70 binoculars. The location was a couple of miles from the intersection of 40 deg N, 75 deg W, in the southern NJ suburbs of Philadelphia, PA. At the time, Pan-STARRS was about 5.5 degrees altitude near Delta Andromedae. At the same time, it was difficult to see M31 in the 16x70s, 11 degrees away at 11.5 deg altitude. The comet will be less than a few degrees from M31 on April 3rd, 4th and 5th when they’ll both be a bit higher in the sky. I had a really nice view of Pan-STARRS with my 12.5-inch Newtonian this past Saturday evening (March 23rd) from the NJ Pines, where it’s a good bit darker than my suburban home, so M31 was visible in the scope (but it looked dimmer than the comet).